﻿ Types of table saw blades – Which one to buy? Table saws operate by spinning of the circular blades placed under the hard surface of table saw. 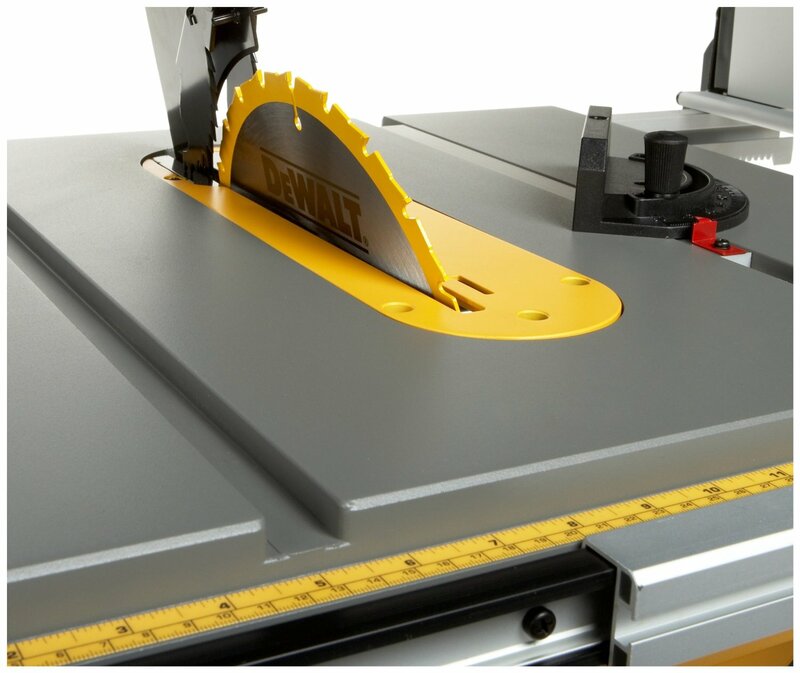 The table top is a smooth space where the ripping material can rest and when blades spin material is pushed towards the blade for accurate cutting. Table saw blade height can be adjusted vertically depending upon how much exposure your table saw needs to give you the cutting material in order to get desired depth of cut. However some table saw allow for adjustments according to axis and angles so that you can get a fixed angle cut for projects that are joint. Initially circular blade table saws were designed to cut through wood only but with advancements now you can also rip plastic and metals with use of this tool. Most of the table saw blades are built from metal and they include some impressive tooth materials for cutting along with carbon composite materials. Table saw blades are similar to that of the circular saw but you may find some exceptions. Teeth of blades may wear out and in that case you would need to make a replacement. Blade changes may be required according to composition of task or if you find that the blades have turned dull and are not cutting well. Use of inappropriate blades may result in a serious injury. There are a number of manufacturers offering different table saws and you can choose the best portable table saw for your projects. But one of the most important considerations is to select an appropriate type of table saw blade. In order to find an ideal choice table saw for you, you need to assess the blade type, size, spacing of tooth, material, speed along with price to see if you are buying a right choice or not? You can examine size of a blade by having an idea about the external diameter along with diameter of central mounting hole. Most of the blades usually have a 10-12 inches diameter and some common sizes are 5 inches to 1 foot. For commercial use, you can find even larger ones too. Thus you need to make sure that you get an appropriate size of blade according to need. Blade size must also be selected according to specifications of manufacturer. Check operating manual of your tool for recommended blade sizes. Also check if the size you are selecting matches the central arbor hole. The table saw blades can be classified mainly in to two types including rip blades and crosscut blades. Both these types of blades can be used for varied purposes. Rip Blade: The rip blades usually have deep teeth that are smaller in number but cut through material really fast. If you want rougher cuts, these blades and their coarse teeth cut through the material grain. Crosscut Blade: For greater finish and smoothness of cut, use crosscut blades. The tooth of these blades work alternately towards the right and left of the center line which gives you a fine wider cut gap. This gap must be considered when users measure materials. Combination blade: These are a combination of both rip and crosscut blades. You can get advantages of both styles and these blades are usually made for some specific usage mentioned on the packaging of the blade. Blades for Special Cuts: Some of the blades are designed to cut through some specific materials such as hardwood, metals, plywood etc. These may also be made for specific cuts like dadoes. These blades are usually much wider and can cut multiple rows. Before opting for any such blade, check your user manual to see if your table saw can accommodate such blade to avoid any kickbacks that may happen with use of a wrong blade. Blades have different composition of teeth that tells you how smooth you can cut. You can find blade teeth ranging from 24 to 80 however some other specific blades may differ slightly in composition. The more teeth your blade has, the more smoothness of cut you can achieve. Apart from smoothness, tooth count also relates to speed of cutting. A higher number of teeth can result in slower speed of cutting that you cannot overcome by hard pushing. Blades are designed to spin fast so that they can stress and break the material apart. Speeds of blades are mentioned in revolutions per minute (RPM). A blade has a specific maximum speed and this specification should be in accordance with the speed of table saw. Usually table saws spin at a speed between 3000-4000 RPM however you may find variations depending upon modifications made. Also note that with some specific materials, use of a speedy blade can cause the material to burn or melt. Blades (plywood and hardwood) are usually made up of hard metal however for cutting tougher surfaces they are made with tougher teeth. Teeth of blades are hardened to serve this purpose around their edges but it is made sure that they remain durable even if they are hard. Different materials of tooth are used depending upon type of blade. For plywood and hardwood blades, steel or carbon steel tooth are used for durable results. For steel and aluminum blades, hardened metal or tungsten carbide is used. For masonry blades, cutting edges with diamond tip are used. For PVC and Acrylic blades, tungsten carbide of low temperature is appropriate. One benefit of table saw blades is that they can be repaired and re-used. You need not to discard your blade if its teeth had loosened its edges, these can be re-sharpened. However make sure you get sharpening done properly in order to avoid any imbalance and danger of injury. There is a wide collection of table saw blades available and picking one right choice can be a daunting task. You need not to purchase a special blade for every purpose as many of the blades offer you versatile usage and can cut everything from hard wood to sheets to joining materials and more. Choose the right blades and make your wood working task even much easier and less time consuming. Pain Behind The Knee How To Make Smoothies – A Beginner’s Guide Exploding Hoverboards?! Which Are Safe to Buy? Cocktail Attire for Men How To Achieve The Perfect Vintage Look For Your Home How To Make An Impressive Big Deal Out Of Your Small Garden? You are here: Home / Blog / Types of table saw blades – Which one to buy?